July 6th, 1914. 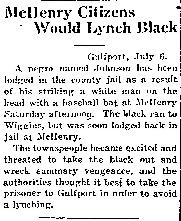 A man identified only by his last name – Johnson – was threatened with lynching after he allegedly struck a white man in the back. Johnson was arrested, then moved between county jails to conceal his whereabouts from local white citizens.